This hybrid variety has excellent flavor at all stages. Young fruit is sweet and sugary, but as it matures, the flavor becomes more complex with a balanced mix of sugars and acids. 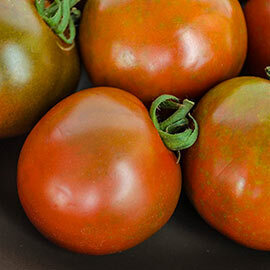 For those who loved the flavor of Purple Cherokee, this variety is for you! With its rich, chocolatey-brown color streaked with brick-red, Black Velvet is pretty to look at, too. This variety stores well without cracking or rotting. Indeterminate. 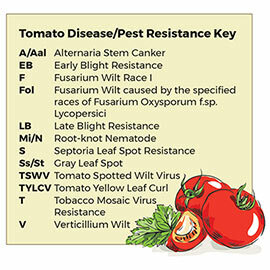 Disease resistance: V FF. 62 days to maturity. Size: 115 - 170 grams. 5 to 6 oz. 2 - 3 inches in length.